The BSA was built for Jay Gary's son to get him into trials Jay now beats Gary very time out. 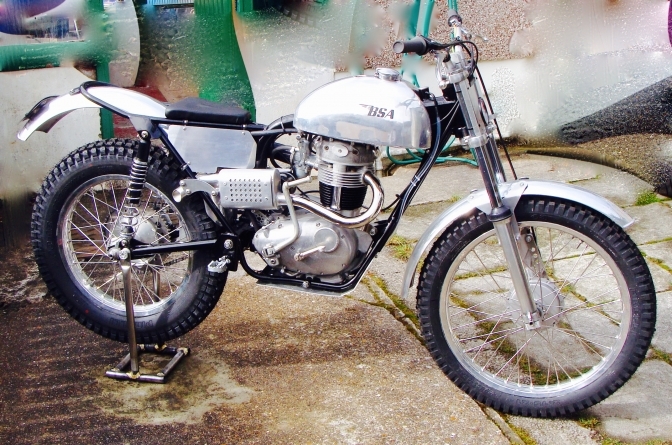 Gary Britton's Second C15 BSA trials build. 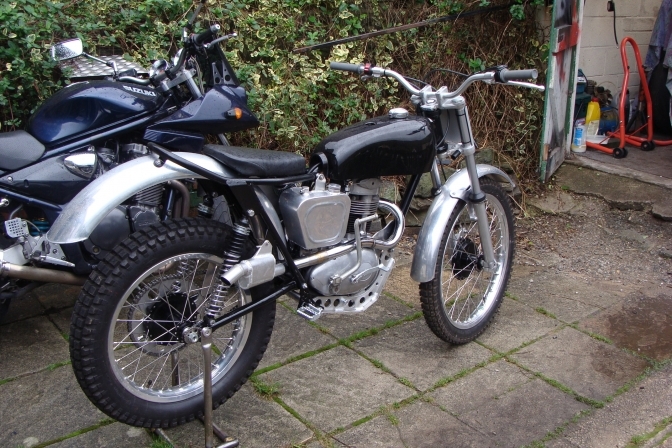 Gary Britton’s BSA C15 Number two Trials bike build. After the Faber framed bike I thought about building another trials bike for my son. So I bought a half finished project. 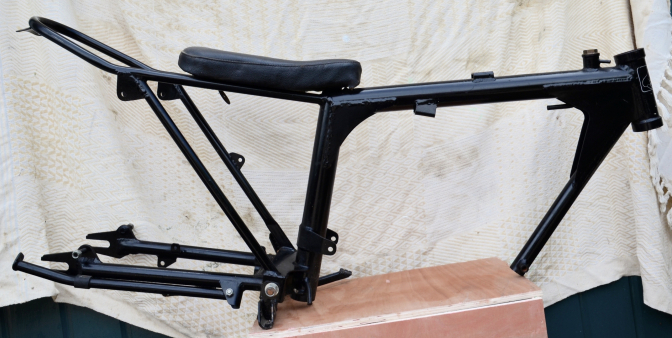 A C15 frame, four stud forks, rebuilt wheels, tank, seat, and handlebars. And most important a rebuilt engine. I thought the motor looked to low in the frame, when fitted , so I converted it to alloy plate mounting’s, so I could lift and move the engine to the left. 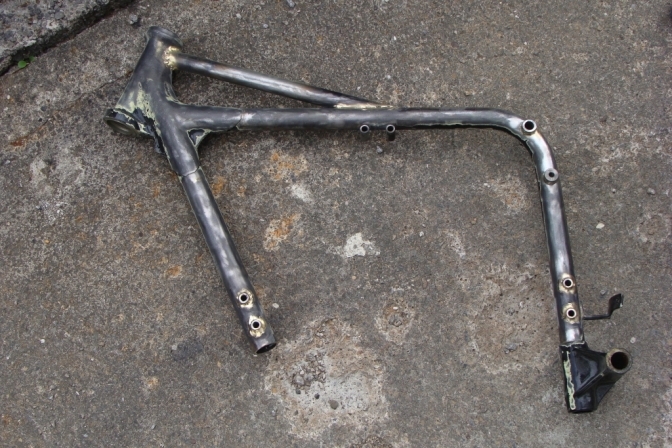 Now there was a big gap between the engine and the bottom of the frame, so I cut out the bottom frame tube. I needed a bash plate so I made up a cradle to tie the front of the frame to the rear, and to protect the crankcase. I cut and lowered the rear shock mounts of the sub frame. And lengthened the swing-arm to prevent mud build up, now it started to look right. No science was involved in all this but "if it looks right then it probably is right is the theory". The rest of the build was easy, the front end was the same as the Faber bike. 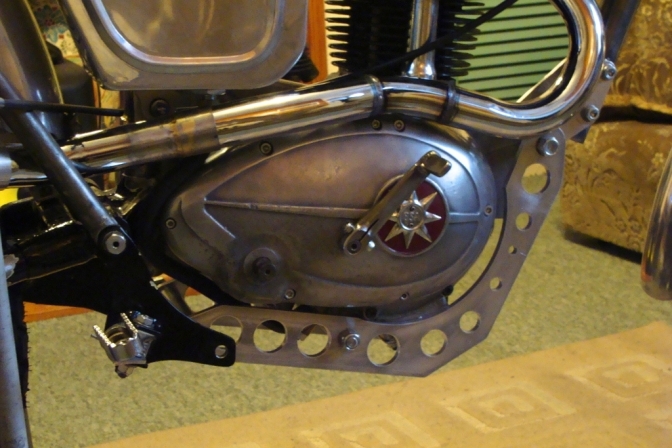 With the BSA/Triumph four-stud forks fitted. I made a few "trick" parts, like the oil feed to the head (Very neat bit of work Gary) and also the silencer. I fitted the motor and it started second kick. 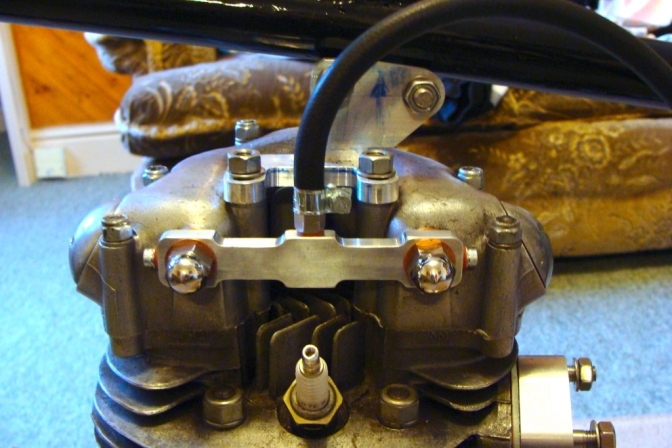 That’s the new Amal carb and Electrex World ignition for you. Apart from wet sumping a bit, it’s proved a very good engine unit. (Sounds and feels better than my motor). The fibreglass tank soon gave up and was replaced with an aluminium tank from Sammy Miller Products. My son has had a couple of top three places on it, so it works quite well don’t you think. Charlie ~Oo> You should be proud of another really good BSA build Gary, and the bike must be good for Jay to keep climbing the competitive ladder he is. Start point was to modify the C15 frame diamond. The top subframe through mounting was the old trick that the "Works" boy's used to do with there frames this lowered the standard sub frame by 2" Buy cutting this out from the frame to the top of the suspension mounting. Then the BSA sub-frame. 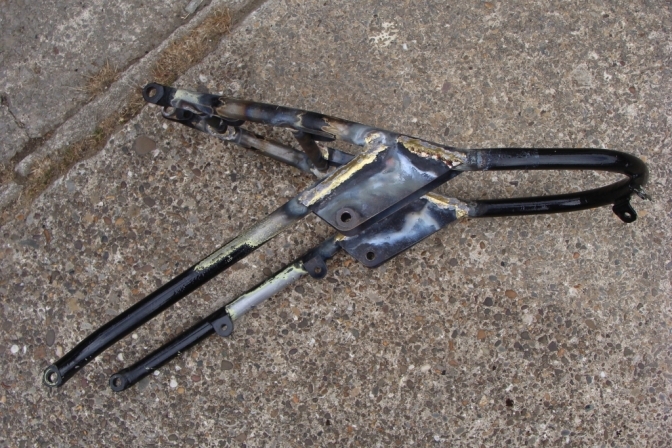 Garry has lowered the frame but then because of the shocks he is using on the build he as lengthened the mounting again to make it very similar to the ones fitted to the standard C15 Frame. 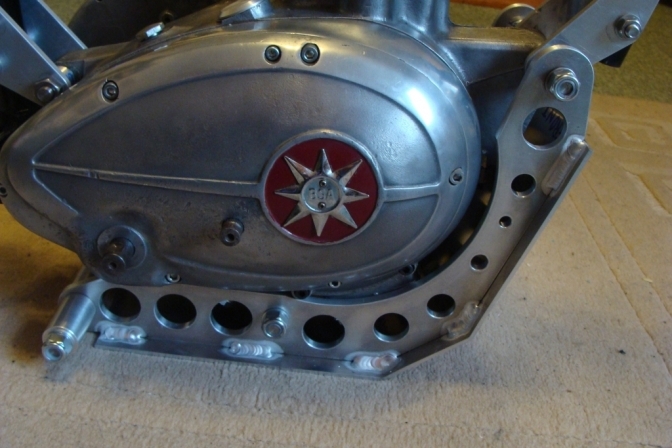 Then the Alloy Cradle for the engine , and to strengthen what had been removed.and to provide a built in sump plate. Nice job Gary and a lot of skill full work. The complete exhaust system again fabricated by Gary. It is the little detailed parts in any build that finish the project off properly. and it is this detail that takes most of the time in a build. but then you have the knowledge that you have a good job. And if the bike works well, which this one does! Just look at Jay Britton's results the built should make you very proud of what you have again achieved. Nice Job Gary. 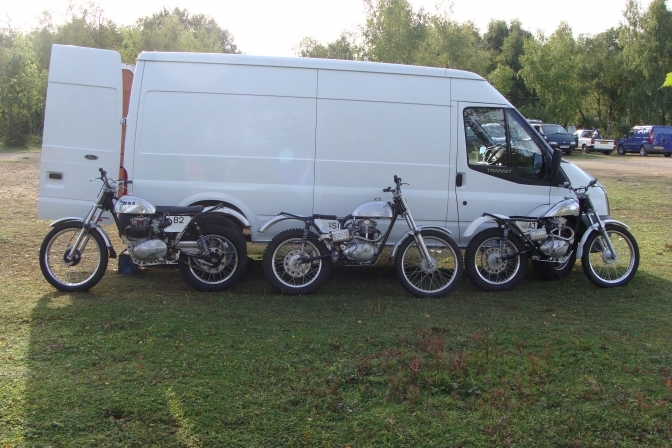 I know you have another build that is nearly finished.We cant wait to see that BSA. Jay has had many a good ride on this machine. and this above all proves you dont have to spend Ten Grand on a machine to become competative. Update later with more information. The tank the same as this on the Mk Otter is fitted to the Number Two bike. Thought you might like a picture of "Big" "Slow" and "Awkward" all together on a works outing for the Golden Valley trial at Breakheart Quarry. I have noticed the Gary rides in the "Euro Cup" on his machine. is that the way we need to go?